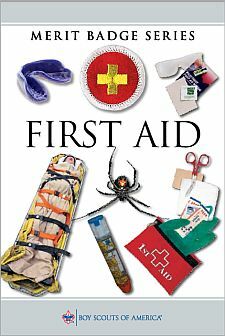 Demonstrate to your counselor that you have current knowledge of all first aid requirements for Tenderfoot, Second Class, and First Class ranks. Prepare a first-aid kit for your home. Display and discuss its contents with your counselor. <>With an adult leader. Inspect your troop's first-aid kit. Evaluate it for completeness. Report your findings to your counselor and Scout leader. Describe the conditions that must exist before performing CPR on a person. Then demonstrate proper CPR technique using a training device approved by your counselor. Explain the use of an automated external defibrillator (AED). Identify the location of the AED at your school, place of worship, and troop meeting place, if one is present. Show the steps that need to be taken for someone who has a large open wound or cut that is not bleeding severely. Show the steps that need to be taken for someone who has a large open wound or cut that is severely bleeding. Tell the dangers in the use of a tourniquet and the conditions under which its use is justified. Describe the conditions under which an injured person should be moved. If a sick or an injured person must be moved, tell how you would determine the best method. Demonstrate this method. With helpers under your supervision, improvise a stretcher and move a presumably unconscious person.